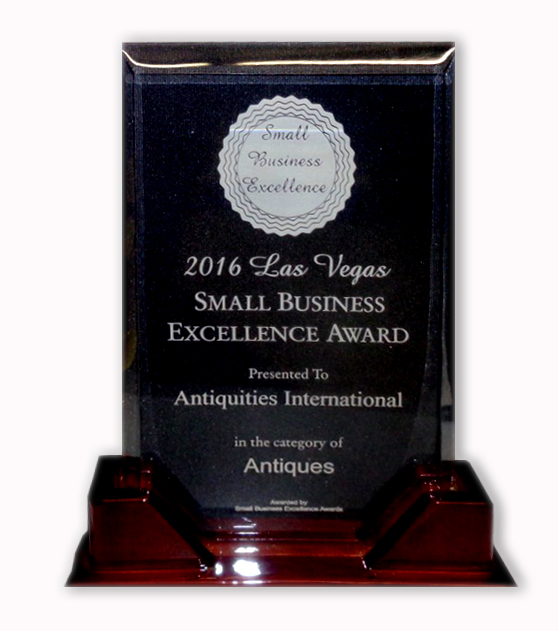 At Antiquities of Las Vegas, we can handle many types of special orders. Do you want to ship internationally? Want to buy in volume? Have a unique packaging question? If so, please use the general form below so that we can take care of your special order needs. The Small Business Excellence Awards recognizes outstanding small businesses that serve the local area. Each year, the local selection committee identifies businesses that we believe have achieved outstanding marketing success in their local community and business classification. Recognition is given to those companies that have shown the ability to use their best practices and implemented programs to generate competitive advantages and long-term value. These are small businesses that enhance the positive image of small business through service to their customers and our community. These exceptional companies help make the area a vibrant and vital place to live. The Small Business Excellence Awards was established to reward the best of small businesses in our community. Our organization works exclusively with local business owners, trade groups, professional associations and other business advertising and marketing groups. Awarding the small business community’s contributions to the U.S. economy.